Limited Edition, d.h. die Auflage ist begrenzt auf 200 Stück. Jedes Bild ist von Mick Cawston persönlich nummeriert und handsigniert. Ein wirkliches Sammlerstück für jeden Hundeliebhaber! 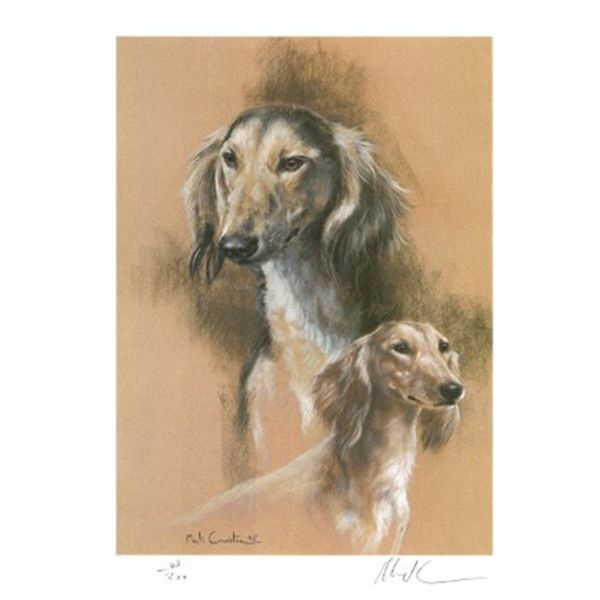 If you were to meet Mick Cawston walking down the path towards you in his battered jacket, his hair down to his shoulders and his knee hanging out of his jeans you would be forgiven for not realising that he is one of the finest dog painters working in the world today. His work is comparable to that of John Emms or Maude Earl and he works equally well in oils, acrylics, water colours or pastels. No matter what breed of dog he portays the character and likeness of the dog are always superb. Many of his works have been reproduced as limited edition prints and for the last two years he has been voted, in the Fine Art Trade Guild survey, as one of the top selling artists. Born in 1959, in Dagenham, Essex. His father teaches and translates the deaf and dumb language for the police. He was educated at the Robert Clack comprehensive school and it was here that he won his first exhibition, at the age of seven. On leaving school he trained as a cabinet maker before signing up in the army for three years. There, amongst other things, he did a six month tour in Northern Ireland. After the army he spent six months working as a motorcycle messenger in London, earning enough money to spend a few months touring Europe. Throughout all this time his passion for drawing grew stonger and on returning from Europe he spent six months sketching people's children on the pavements of Covent Garden in pastel. From here a London silversmith employed him to design silverwave, largely for the Arab market. However, interestingas this was, it was never Mick's great passion and before very long he moved away from London and spent the next three years living in a small cottage on a farm in Burnham on Crouch and returned to selling his work on the streets. However he could not make a living and as a result started to paint seriously in oils in the early part of 1987. By the middle of 1987 he had been discovered by Sally Mitchell and by the end of this year he had his first two limited edition prints published after his work.